"It sounds odd, but programmed cell death is important to all large organisms. For any cells to differentiate, they have to be able to kill cells. For example, if you injure yourself, your scab is formed with these killed-off cells," explained Rebecca Case, associate professor in UAlberta's Department of Biological Sciences. "Here at the single-cell level, we've found that small molecules are passed from bacteria into the host algae. By doing that, the bacteria are able to tell the algae to kill itself." Until now, programmed cell death, also known as apoptosis, was thought to only occur in large, multicellular organisms such as animals and humans. 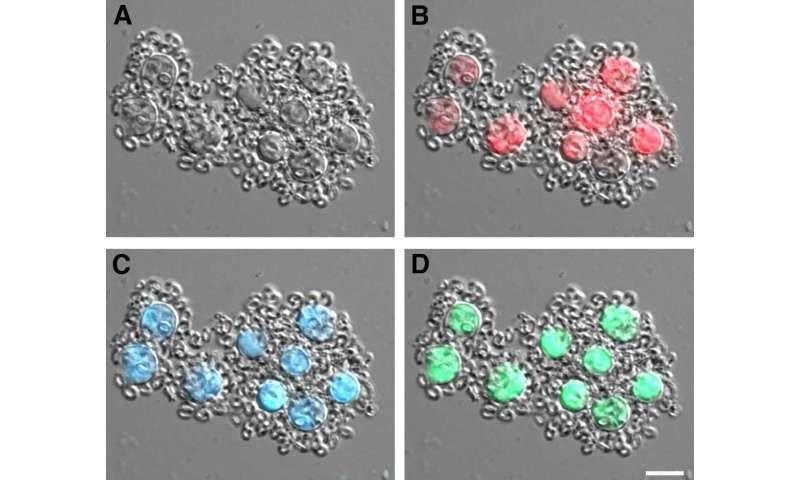 This research shows that bacteria that live on single-cellular algae can cause programmed cell death. "It is the first documentation of true apoptosis via bacterial pathogens in microorganisms like algae," said Case, who conducted the work with Ph.D. graduate Anna Bramucci. "In interactions like these that occur in close proximity you can find molecules that are effective in very small concentrations," said Case. "Going forward, that's what we want—really potent molecules." Another area of interest is in natural fuels derived from living matter, called biofuels. "Algae can also be used to create lipids for biofuels," explained Case. "If we can better understand their life cycles, we can find ways to keep them alive for longer, to produce more fuel for industry." The paper, "Phaeobacter inhibens induces apoptosis-like programmed cell death in calcifying Emiliania huxleyi," was published in Scientific Reports.